Epic storage potential with flexible high-capacity HDDs and high-performance SSDs. Native high-speed SATA 6Gb/s empowers SSD caching. Provides real-time system information for easier system management. Supports SATA 6Gb/s M.2 SSD with 2242, 2260, 2280, and 22110 form factors to provide the greatest flexibility in tiered storage configuration and enables cache acceleration. The TS-1685 features M.2 cooling modules for keeping the M.2 SSDs cool and stable. Note:M.2 SSD is optional; M.2 cooling modules are built-in. M.2 SSD operations can easily generate excessive heat, and it is recommended to install a heatsink (from QNAP or a third-party provider) on the M.2 SSD. Featuring the latest 14nm energy-efficient SoC, supporting DDR4 RAM and PCIe Gen.3 per-lane throughput. Supports four DDR4 memory modules for a maximum of 128GB RAM. Comes preinstalled with 16GB/32GB/64GB/128GB RAM. Two PCIe Gen3 x8 slots and one PCIe Gen2 x4 slot. Supports 10GbE/ 40GbE adapters, PCIe NVMe SSD, external graphics cards, and USB 3.1 expansion cards. Fully supports 10GbE high-speed networks for iSCSI/NFS/CIFS data transmission. Separately detects the CPU and hard drive temperatures to dynamically control fan speeds for quieter operations. 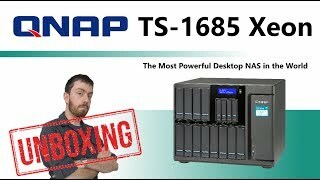 Read more about Qnap TS-1685-D1531-64GR auto tiering. If you buy this Qnap Desktop NAS and hard drives we do free build and test for the unit and hard drives. So you can use this device straight out of the box. All free of charge in TS-1685-D1531-64GR price.